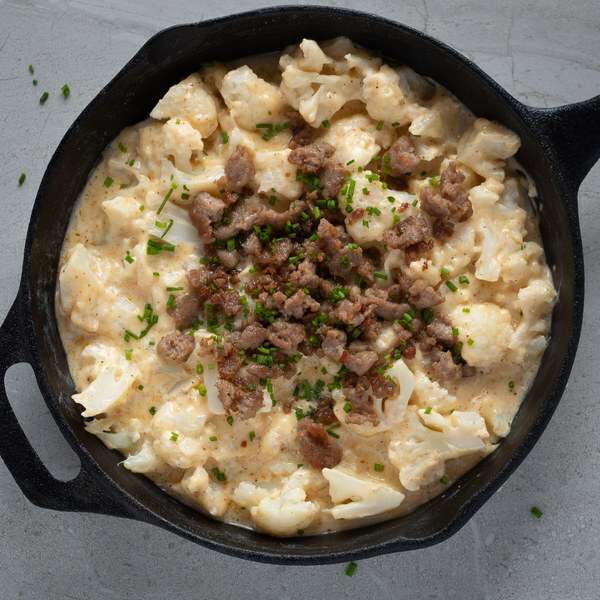 ← Rich Cauliflower Mac & Cheese with Sausage . Wash cauliflower and cut off the leaves. Separate into small florets and cut the thick stems into smaller pieces. Transfer to a medium sauce pan. Add water to the pot, so that the cauliflower is just covered. Bring to a boil over high heat. Cook until fork-tender, 4-5 minutes. Drain and set aside. Once the skillet is hot, add coconut oil and swirl to coat the bottom; add the sausage. Cook, stirring often, until browned and cooked through, 8-10 minutes. Once done, transfer to a plate and reduce heat to low. Wash and chop chives into small pieces and set aside. Coarsely grate 1 cup of cheddar. Finely grate 1 cup of Parmesan. Melt butter in skillet. Add garlic and stir until fragrant, 1-2 minutes. Add flour and whisk until smooth. Whisk in cream a little bit at a time, making sure it is well combined before adding more. Then add cheddar cheese, Parmesan cheese, mustard, paprika, and pepper. Cook, stirring well, until the cheese is melted and the mixture is smooth. Add cauliflower to the cheese sauce and stir until well coated. Sprinkle with sausage and chives. Enjoy!